Oregon hasn’t been the most consistent team this season, but the Ducks might finally have figured out its identity in order to win teams. They forced Stanford to miss its first 20-of-21 shots from the field to begin the game to open up a 16-2 lead to go on for a huge 69-46 win at Matthew Knight Arena. With the win, the Ducks improved to 15-9 overall and 6-5 in league action, while the Cardinal dropped to 12-11 overall and 5-6 in Pac-12 play. Oregon also moved up to fifth place in the conference in what has been a crazy season. Only Washington has separated itself from the pack. Oregon is just one game out of second place with the Civil War next on the schedule. Payton Pritchard led the Ducks with 20 points and Louis King added 16 points to go along with seven rebounds. Victor Bailey Jr. came off the bench to score 11 as well. Kenny Wooten was a defensive beast, tying his career-high with seven blocks. For a bit, it looked like the first to 21 would win the game. Stanford could muster up just two points in the first 13 minutes of action. The Cardinal might have considered themselves fortunate to be down just 16-2 as Oregon wasn’t playing its best offensive basketball either. Once Stanford was able to make a few baskets, it was able to pull to within 10 of the Ducks at 30-20 when the halftime break came. Kz Okpala’s three-pointer made it 38-31 with 15:23 left, but that was as close as Stanford would come to Oregon. After a 10-1 run, the Ducks managed to put the game away by forcing turnovers and easy baskets on the other end. King’s hook shot made it 58-39 with 6:35 left. 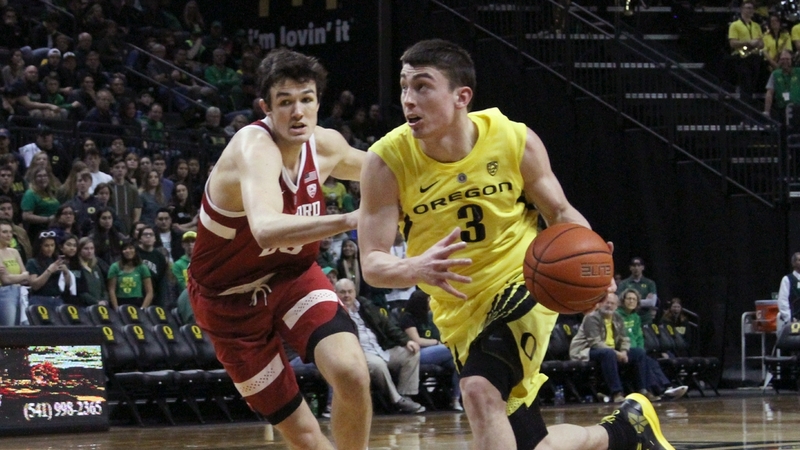 The only question would be if the Stanford’s men’s team could score more than its women’s team who fell to the Ducks earlier in the day 88-48 down on the Farm. The answer is they couldn’t. Wills (13 points) and Okpala (10 points) were the only Cardinal in double figures. They finished the game shooting 15-of-55 from the field (27.3 percent). On the other side of the floor, Oregon was much better. The Ducks shot 44 percent on 26-of-59 from the field, including 7-of-17 from three-point range. They outrebounded the Cardinal 41-37 and committed just nine turnovers. Now Oregon will try to get avenge an earlier loss to Oregon State when the Ducks go up to Corvallis to take on the Beavers. 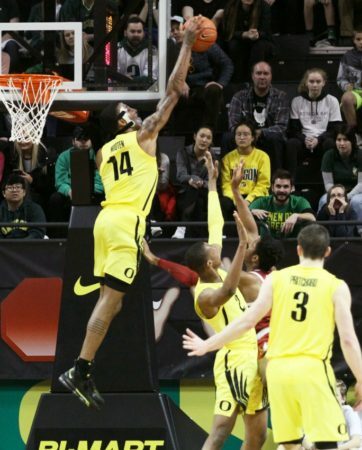 The Ducks crawled out of an 18-point deficit in the first game, only to watch OSU take the win in the final minute. Oregon State is tied for second with Arizona State and Utah as they all have a 7-4 league mark. The Beavers are 15-8 overall and like the Ducks, they will be looking for prime positioning for post-season play. The second Civil War contest will be on the Pac-12 Network at 7:30 pm.